Let me start by saying, this might not apply to some of you HR and benefits pros, as you might have a great, two-hour health/wellness fair that's highly attended and vendors knock down your door year after year to be a part of your event. However, not everyone has that same experience. But on the bright side, it might a simple problem you can easily fix. All you might need to do to have a successful health/wellness fair is decrease the duration of your event. "My health/wellness fair isn't too long. That's not my problem." But from my experience, 75-80% of the health/wellness fairs I have personally attended have been too long. So in case you're wrong, check out the warning signs you can spot during the planning of your health/wellness fair. Hopefully, they can persuade you to change the duration of your event, preventing the problem before it happens in 2017. "Umm, let me get back to you." When contacting vendors for your health/wellness fair, does it always seem like you're pulling a horse to water? You might have to contact vendors multiple times just to get a confirmation. They are initially excited; then you start giving them the details of the event, and their entire attitude changes. Most likely, it's because the duration of your event is too long. It's difficult for vendors to block huge chunks of their schedule for a health/wellness fair. And because of this, they'll try and wait until the last minute to confirm. Just by decreasing the duration of your event, you could make it much easier on yourself when securing vendors! "Is lunch (or food in general) provided at the health/wellness fair?" If you're going to have a health/wellness fair that's going to be long and run through the lunch hour, I highly recommend proving food to your vendors. "When is the break in the health/wellness fair?" It's because your health/wellness fair is too long. From experience, I highly recommend that you have a break for the vendors if your employee health/wellness fair is four hours or more. Vendors will tire out, start to sit down at their booth and will not provide the same effort as they did in the first couple hours of the event. A break in the health/wellness fair is critical in ensuring these problems do not occur. If the above warning signs are occurring during the vendor securement process, you might want to reconsider the duration of your event. Now, those were warning signs you can spot prior to the health/wellness fair happening. Below are the warning signs you can spot during the actual health/wellness fair. Look around your health/wellness fair (or recall your event last year). There are hardly (maybe even none) any of your employees at the event. Do you see nice vendor booths with no vendors reps attending them? That's because employees have stopped coming through the health/wellness fair and your vendor reps have wandered over to chat with other vendor reps. They're trying to pass the time, waiting for the event to end. And of course, one or two of your employees finally come out to the health/wellness fair and walk up to a vendor booth that's empty. Avoid this by shrinking the duration of your health/wellness fair. If employees are consistently flowing through the event, you will not have to worry about this issue arising. 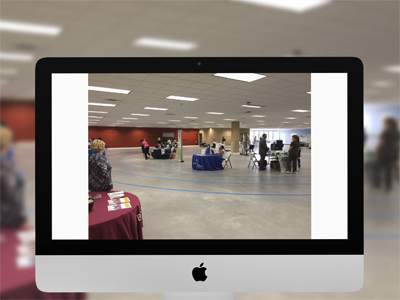 Once again, you're looking around your health/wellness fair (and it looks NOTHING like the picture above). This time, all vendors are at their booth, but half of them have their heads buried in their laptops checking emails, doing office work, playing solitaire, etc..
You have them at five-hour health/wellness fair, and most of your 120-employee population base came through the event in the first hour and a half. If you don't want them to fill the time with other activities, keep your event shorter and keep the employee flow steady. Where And The Heck Did They Go?! This will be the last time we'll do this exercise. I promise. So this time, you come back from the bathroom, and two or three of your vendor tables are empty! Or, they were kind enough to wait until you came back so they could offer up some excuse about needing to get back to the office. To beat a dead horse - you kept your vendors at an empty health/wellness fair too long. And this can start a snowball effect that you can't stop. Other vendors - who wanted to leave, but were too scared - now have the confidence to do so when they see another vendor pack up early. By this time, the damage is done. Recognize your mistake and close down the health/wellness fair allowing all vendors to leave. Remember, a cruise ship doesn't wait for five people. Hopefully, you take note of these warning signs, and they help you avoid making the mistake of hosting a dreadfully long, health/wellness fair. Becuase if you continue to do so, it's going to get harder and harder to secure quality vendors for your event. Provide Lunch - Rejuvenate your vendors for the second half of the event by giving them lunch and time to recharge. Break It Up - Break your health/wellness fair up into two segments. If you can't provide lunch, give vendors a break to leave their booth set up, grab lunch, and then come back for the 2nd half. I hope this post helps when it comes time to plan your 2017 health/wellness fair.